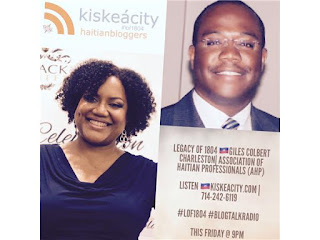 This Friday at 9PM, join me as I welcome IT professional Giles Colbert Charlteston, co-founder and Board member of the Association of Haitian Professionals (AHP). We'll discuss the Association, his experience as a tech professional in Haiti and his pre-earthquake move to Haiti and back. The show will stream live here or you can listen at http://www.blogtalkradio.com/pancaribbean/2017/01/28/legacy-of-1804-giles-colbert-charleston-association-of-haitian-professionals or on the phone at 714-242-6119. We discussed the meaning of the phrase "haitian professional", Haitian professionals and self-determination, technology's bright future in Haiti, Digicel's morphing into monopoly, the TESS platform and Giles's move back to Haiti before the earthquake. Don't miss AHP's 3/18 Gala in DC to raise funds for multi purpose community center in DC, among other goals.